Animal Defenders International : Animals in entertainment : ADI unites with politicians and celebs to Stop Circus Suffering in the US! ADI unites with politicians and celebs to Stop Circus Suffering in the US! Animal Defenders International (ADI) has teamed up with politicians and celebrities to launch H.R. 1759, The Traveling Exotic Animal and Public Safety Protection Act (TEAPSPA) , a bill that will end the suffering of wild and exotic animals in traveling shows in the US. 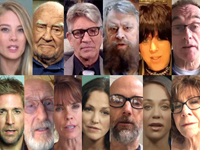 Watch the video now, featuring actor Ed Asner, actor Eric Roberts, actor Mindy Sterling, actor Eric Szmanda, musician Moby, actor Alexandra Paul, actor Tonya Kay, actor James Cromwell, director Danny Boyle, actor Kim Matula, actor Brian Blessed, and songwriter Diane Warren! Speaking in Congress, TEAPSPA sponsors Representatives Ryan Costello (R-PA) and Raul Grijalva (D-AZ), ADI President Jan Creamer, with CSI actors Jorja Fox and Eric Szmanda, concluded that ending traveling wild animal acts is the only practical approach to protecting public safety and tackling the animal suffering inherent to the industry. The bipartisan bill is expected to receive widespread public support, as across 27 states in the US, 71 jurisdictions have already banned or restricted the use of wild animals in traveling shows, often citing animal welfare and public safety concerns. Around the world, 35 countries have banned wild animal acts. Federal oversight of traveling animal acts is costly, problematic, and unmanageable. Nominal licensing fees and minimal, inconsistent monetary penalties don’t cover oversight costs; they are largely borne by taxpayers. The US taxpayer effectively pays for 87% of the licensing costs whereas the circus only pays 13%. To ban wild animals in circuses altogether is cleaner, less costly, and more easily enforced than the current, costly, admittedly problematic and ineffective regulatory oversight. The current administration is calling on Congress to make deep cuts to the budget, with an eye toward less government regulation. Passing the Traveling Exotic Animal and Public Safety Protection Act (HR 1759) will protect animals and public safety while saving taxpayer money and reducing government regulation. ADI advocates the change of business model to human-performance circuses, which are popular, provide employment and stimulate the economy, without exposing citizens to stressed and abused animals. Please support H.R. 1759 (TEAPSPA), the bill that would secure a national US ban on traveling wild animal acts! Sign up for our eAlerts to receive the latest news and ways to help. Help spread awareness for suffering animals by sharing our action calls on Facebook and Twitter!